The Nikon 1 series of camera was released in October of 2011, marking the company's entry into mirrorless interchangeable lens cameras. The camera uses a new proprietary lens mount, and three lenses were released at the camera's launch: the Nikon 30-110mm ƒ/3.8-5.6 VR is a telephoto zoom lens that complements the 10-30mm ƒ/3.5-5.6 kit lens that is sold with either the J1 or V1 camera. Combined with the CX sensor of the 1 series camera, which produces a 2.7x ''crop factor'', the 30-110mm lens offers a 81-297mm equivalent field of view. This lens isn't a ''constant'' aperture lens, in that as you increase the focal length, the maximum aperture size decreases, though the minimum aperture remains the same. The following table reflects the maximums and minimum at various focal lengths. 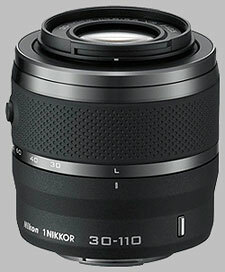 The Nikon 30-110mm ƒ/3.8-5.6 VR takes 40.5mm filters, and takes the HB-N103 circular lens hood. We're not sure if the lens hood is included with the lens: the lens is available now for around $250. The Nikon 30-110mm ƒ/3.8-5.6 produced some truly excellent results for sharpness, and seems to be optimized for wide-open use. It's a fairly simple observation of the data: it's tack-sharp when used wide open at any focal length. For the most part, there's negligible improvement when stopped down, or in the case of telephoto use at 110mm, there's actually a slight reduction in overall image sharpness when stopped down to apertures smaller than ƒ/5.6. Even then, this reduction in sharpness isn't really noticeable until quite small apertures of ƒ/16, or for the true pixel-peepers, perhaps at ƒ/11. Overall though, for the cost and size of the lens, we're quite impressed with the sharpness of the images produced with this lens. There is some slight chromatic aberration of note when using this lens, but it's really only apparent in the corners, in areas of high contrast, showing as purple fringing. The only focal lengths that see any corner shading when the lens is set to 40mm or below. At these focal lengths, used wide open at ƒ/3.8, the extreme corners of the lens are around a half-stop darker than the center. At other apertures or focal lengths there is no corner shading to speak of. The Nikon 30-110mm ƒ/3.8-5.6 VR offers results for distortion typical for a telephoto zoom lens: Some barrel distortion at the wide end, and pincushion distortion at the telephoto end. There's a point of parity at 40mm, where there's essentially no distortion. The Nikon 30-110mm ƒ/3.8-5.6 focuses very fast and near-silently, taking less than a second to focus from infinity to close-focus. Point to point focusing is a bit faster - more so at the wider angle than at telephoto. It's worth noting at this point that there is no manual focusing ring - it's possible to focus manually, but that's done via a camera control. Magnification is only 0.1x, and minimum close-focusing distance is 100cm (over three feet), providing poor performance for macro work. The Nikon 30-110mm ƒ/3.8-5.6 VR is a small zoom lens, mating very nicely with our J1 test body and providing a stable, if small and light, shooting platform. 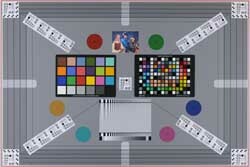 The lens is available in five colors: red, white, silver, black and pink. Our sample was the fashionable glossy white version. The only control on this lens is the retractable lens lock switch; pressing this button and turning the zoom ring extends the lens for use, as well as turning on the camera. 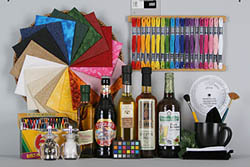 For a kit lens, the design is fairly substantial: 18 elements in 12 groups, including 2 Extra-low dispersion elements. The lens also features seven rounded diaphragm blades to make up the aperture. For the image stabilization testing, it's worth noting that the testing was done with the Nikon J1, which must be held out in front of you for shooting since it has no viewfinder. If the V1 had been available, we could have used it's viewfinder as a third point of contact, for even steadier shots. The Nikon J1 has a Normal and Active mode for VR: we used the Normal setting in our VR testing, which compensates for motion in the left-right axis but not up and down. We did test the Active mode, which compensates for movement left to right, as well as up and down. Holding it still for our tests, we sometimes got slightly better IS results and sometimes we did not. For extreme movement the Active mode may be better but we have no way to reproduce that kind of movement for the hundreds of shots needed for IS testing. At the time of writing, no other third party manufacturers produce lenses to fit Nikon's V1 and J1 camera, so you're left with Nikon's other offerings. The 10-100mm offers similar quality, but much greater telephoto performance, at a significantly high price point and size. It doesn't balance quite as well as the 30-110mm, and doesn't offer as-sharp images, but for the versatility you get (it offers an equivalent 270mm maximum focal length) the compromise is acceptable. Technically, with the Nikon FT1 adapter, you should be able to mount this DX lens on the J1 or V1, and obtain an equivalent 49-283mm field of view. The 18-105mm tested quite well on the D200 body, so mounting it on the J1 or V1, which would crop out any problematic corners might make it an excellent lens there as well. The Nikon 30-110mm ƒ/3.8-5.6 VR really surprised us - for its small size and weight, it produces excellent photographs. If you're interested in buying a Nikon J1 or V1, this an excellent complement to the 10-30mm ƒ/3.5-5.6 VR kit lens. The build quality of this little lens is very good. The lens barrel and bayonet are made of metal and the lens weighs almost nothing. It feels and looks clean and sturdy. I find the zoom ring a bit stiff. Autofocus is fast, accurate and silent. In good light it's lightning quick but even in low light the lens locks on reasonably quick. The image stabilization allows hand held shooting at low shutter speeds. It's quite effective. Center sharpness and contrast are very good wide open. Totally usable, very nice. The corners are a little soft though. Unfortunately there also is some visible CA and distortion. Some of it can be removed in post processing. Overall the image quality is very decent for a small lens like this. If you like the Nikon 1 system, I think this is a vey nice lens to have in your bag. This lens is a keeper. Super sharp, and tiny for what it does. A must have lens to compliment your 10-30VR. Buy this lens and enjoy the reach it gives.